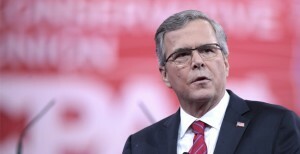 Sixty percent (60%) of Americans would not consider Jeb Bush for president, compared to 51% who said the same about Hillary Clinton, according to national poll of mostly conservative voters. The George Washington University Battleground Poll of 1,000 registered voters, of which only 16% identified with the Tea Party, also found that 48% of voters have an unfavorable view of Bush compared to only 44% who have an unfavorable impression of Joe Biden. Overall, Americans have a more favorable view of Clinton (47%) and Biden (39%) than they do of Bush (35%). All three presidential candidates led the rest in name recognition.